Home Restaurants/Bars Restaurants Crowded House Mediterranean Restaurant on Queen St. E.
Crowded House Mediterranean Restaurant on Queen St. E.
Sometimes hanging around the city during a long weekend really pays off. 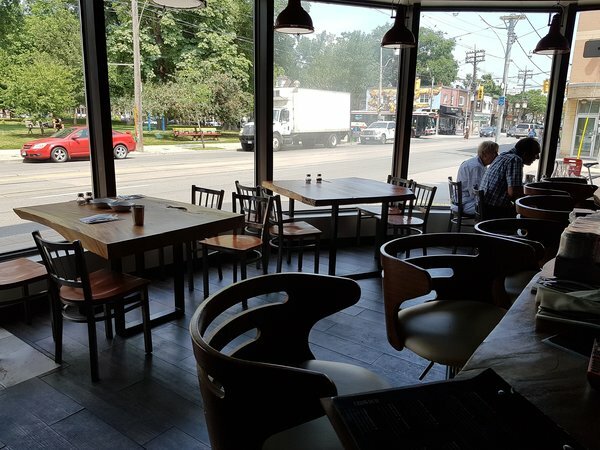 For instance, we were looking for a restaurant in Leslieville for lunch on the Civic Holiday weekend and decided upon Crowded House on Queen St. E. This Mediterranean restaurant has been open for three months and will be getting its liquor licence next week. 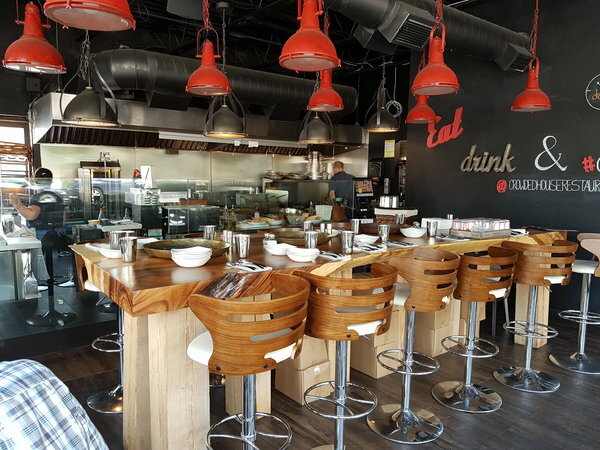 I have passed this restaurant a few times on the streetcar and noticed that it was indeed “crowded” and I was intrigued by the welcoming floor-to-ceiling windows so I was eager to check it out. Crowded House at 1161 Queen St. E.
Despite being the long weekend or perhaps because of it, we were able to get a reservation for 12:30 p.m. Crowded House is a very small space with about six tables of four, as well as a large communal table. We were delighted to not have to fight the crowds to get in. We were quickly greeted by our server and offered both breakfast and lunch menus. Our server explained that the menu offers culinary influences from Turkey, Israel, Morocco, Lebanon and Egypt and everything is made from scratch. Two of the members of our party ordered omelettes from the breakfast menu while my sister and I ordered some of the specialties from the lunch menu. 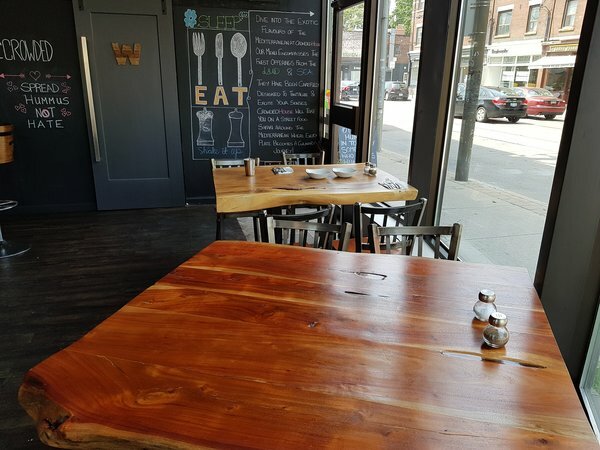 Formerly a nail salon, Crowded House is a really gorgeous space with stunning hand-carved wood tables and an open kitchen. I love the funky sliding door leading to the men’s and women’s washrooms. We waited about 20 minutes before our food arrived. 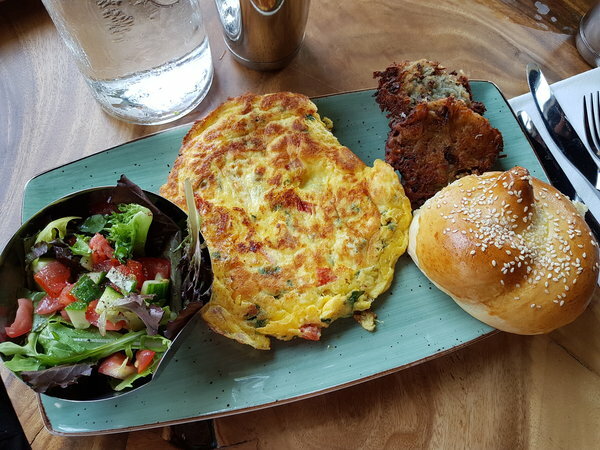 The House Omelette, $10, is made with baby spinach, tomatoes, red onions, feta cheese, and cheddar cheese and is served with Mediterranean salad, potato latkes and a freshly made Challah bun. 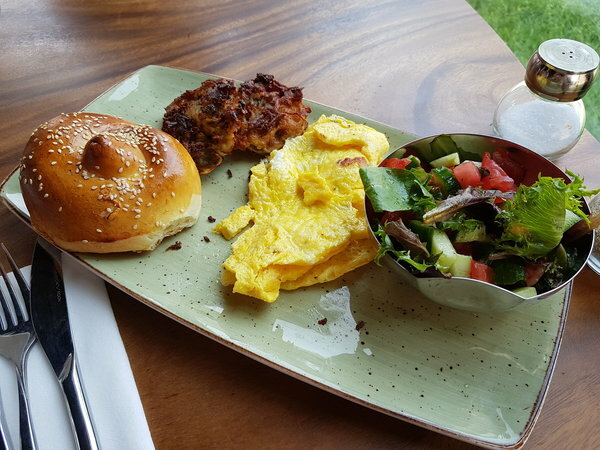 The Omelette Straight-Up, $7, is served with chopped Mediterranean salad, potato latkes and Challah bun. Both of the members of our party who ordered the omelettes enjoyed them. They particularly loved the crispy potato latkes, which were stuffed with onions. My Fried Eggplant, $7, featured fried eggplant treated with Himalayan salt and topped with fresh herbs and crushed garlic. The eggplant was tender and delicious. 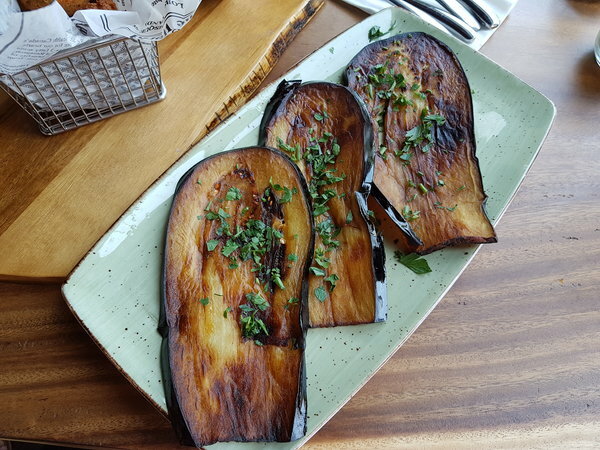 Eggplant can be bland on its own, but it really absorbed the flavours of the garlic and herbs. I also ordered the Falafel, $8. These handmade balls are made with ground chickpeas, fresh herbs and signature spices and served with tahini. I loved the crunchy texture of these falafel, but I would have preferred them to be a bit spicier. My sister’s Shawarma Plate, $16, featured spit-roasted turkey and lamb shawarma, marinated in a Mediterranean spice blend and served with chopped salad and a choice of side. She chose the Majadra (also known as Mujadara) as the side. The turkey and lamb shawarma was tasty and the usually strong flavour of the lamb did not overpower the dish. The Majadra was the star of this plate – tender lentils mixed with fragrant Basmati rice and fried onions. This dish was well executed with the perfect blend of spices. 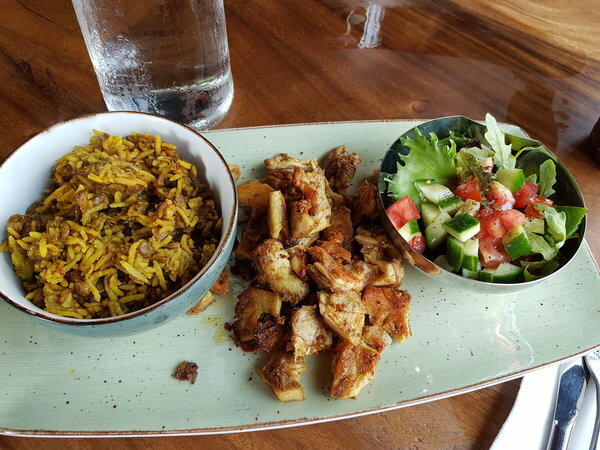 I definitely recommend ordering the Majadra if you visit Crowded House on Queen St. E.
We were very pleased with the cooking at Crowded House. 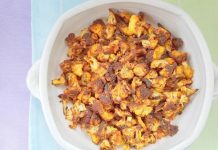 It was apparent that a lot of thought and care went into the preparation of every dish. 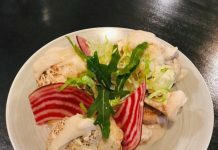 We also felt that the substantial meals offered great value. 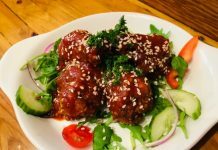 We were so glad to be able to try this new Toronto Mediterranean restaurant. Love the atmosphere/look of the restaurant! The Shawarma Plate looks dellicious.